Sometimes a visitor flies one of our sites and shows us what can be done. They may not know that flying over Boogaland, in the lee, dodging clouds isn't a good idea. But this time, serendipity inserted itself, took one pilot that should have known better, put him in a place were he wouldn't normally be, and offered up a new line. The day began with Punaluʻu showing 100-ish degrees at 10 mph, which is a little south of east but doable from this sensor. The trouble was with the clouds that completely enshrouded the Koolaus. From Kailua, only Olomana could be seen in the foreground. At 10:00am, Alex chirped on chat that conditions looked good and requested some company. By then the ceiling began to lift, coffee was complete, and Sidehill and I decided to roll. When we reached Kaʻaʻawa, we could see Alex was up over Rhino Horn. He was making it look good. We scrambled up the trail that was beginning to get overgrown, from lack of traffic, no doubt. The wind was perfect off the east launch and we joined Alex just past 12:00 noon. No one had any real hope of making a successful bay crossing with the conditions as east as they were, so we set our sights on turning left. After working some thermally ridge lift near Puʻu Piei, some really sweet developing clouds flowed through that offered lift around their edges as they flowed toward Punaluʻu Ridge. I suggested it was time to go. Before I had answers, Alex and Thom were off and I was in the chase. As expected, there was a bit of sink over the valley, but the ridge was working well on the other side. We took our obligatory turns over Sacred Falls, which is always impressive to me. These turns had to be done with breaks in the clouds, however. They were wafting up the ridges steadily and illustrated the lift (and sink) in the air vividly. It was a symbiotic relationship with clouds that showed lift, but never got too thick to see where you needed to see and never really got in the way of where we wanted to go. Like Alex said, “If there are no clouds, there is sink. When there are clouds, there is lift.” Lift is good. I’ll take the clouds. I ended up taking a line down Punaluʻu Ridge, with Pyramid up ahead. My thought was, if there is lift, keep going. If the lift quits or it gets ratty, turn around and fly back through the air behind that is in clean lift. I went deep. Oh, and the symbiotic thing kinda quit happening. Along the ridge, the clouds began to get a little thick as I climbed on my line, so I went 90 degrees left. I was near 900 meters at this point (just over 3000 feet). This new line sent me on a track toward the back of Kahana Valley, deep over the area dubbed Boogaland by hang glider pilots of old, where the only landing is in trees and three miles is a day’s hike. With the cloud stretching across most of the valley, I would have had to go at least halfway across it before heading back to Punaluʻu Ridge. Again, my thought was to stay on this line until the lift quits or the air gets ratty, then turn around. The lift wasn’t much, but it was lift. Eventually, Kahana Ridge was about 3:1 under my feet, and I knew I had it. I hit sink in the lee, mashed full bar and still had a 5:1 glide. I cleared the ridge, connected to lift on the windward side, and made it back to the Rhino Horn, handily. I was never lower than the highest peak along the ridge, (Puʻu Piei). Here is the track log. Can this be done in reverse? I’m not sure, but I think it might take more commitment to find out. 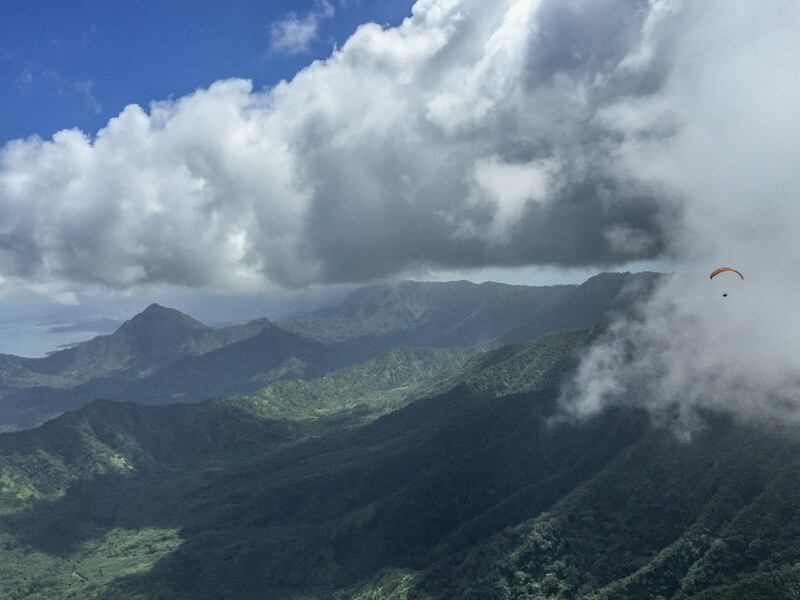 Apart from the clouds, could Punaluʻu Ridge be flown farther? I don’t know that either, but I think that if clouds allow it, and there is consistent lift in clean air, someone may show us that other routes are possible as well. Let’s hope it’s not a visitor! Perhaps it will be protégés, Steve and Drew, who were flying after we three landed. We had enjoyed a nice veggie meal, courtesy of Dorothy, and spotted them from the Colby’s rooftop. We returned to Kahana Beach near 5 PM, just in time to see them peel left and land at Punaluʻu. Others flew Makapuʻu and there were quips on chat of flights with cheerleaders. Let’s hope for ink (and photos) on that story! I am not sure but I think, I am still allowed to comment. Thanks for the write and color and edits. Most of all to the new door that may be opened to many new trips. Very nice. I think the new part is flying back to the front of Puu Pei. Many have headed across the valley from Puu Pei in various forms. 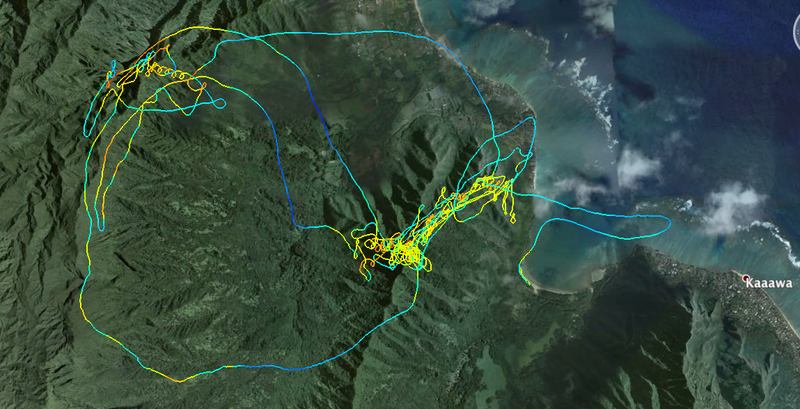 A few have been blown straight over the top of the Koolau from Kahana, ie Becca and Frosty. The lift in Booga starts from in front of that little cross ridge a little further in. There is a sinky area behind that and big lift all the way to the back. The biggest challenge is the lack of headroom due to low cloudbase. I think a great line that needs to be explored, is going straight back along the spine to the very back of the valley. It looks like it should work, but if it is windy enough to get high up front, I think it might be strong in the back. If it is only thermals, it might be too light. A safer bet might be to slide down Punaluu ridge and go all the way through Boogas. It might be a great start for a ride to Makapuu. Since I am talking crap, there is a clearing 1.8 mile over the back from Boogas toward Waihiawa. If you get real high back there, you can make the big leap, and head on the way to Kaena point. But the Koolaus are close to 3k, and it is hilly and high tiger country that way. Someone will do it one day. Dave, I will follow you! Yes, Becca and Frosty have pioneered some lines, and don't forget Ramjet!